THE Brisbane Bullets have produced a remarkable come-from-behind fightback to mow down the Adelaide 36ers 102-90. The Sixers had led at every change and held a healthy 76-65 late in the third quarter before being completely snowed under by a match-turning 23-2 burst by the Bullets at in Adelaide. 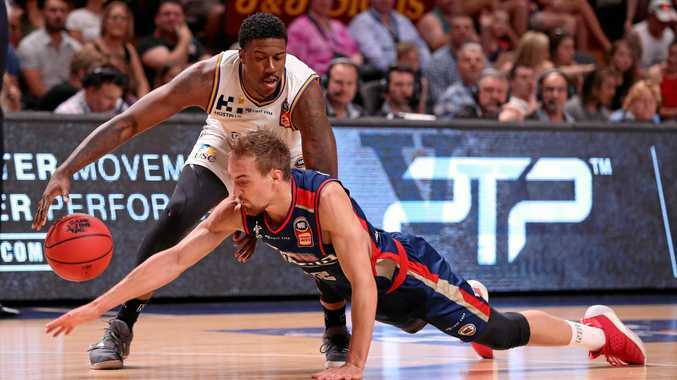 Adelaide's loss was further soured by the news Majok Deng had suffered cracked ribs in a collision with Brisbane enforcer Mika Vukona, and import Ramone Moore hurt his calf. Captain Cam Gliddon, with 16 of his 22 points coming after half-time, was key in the Bullets' blistering 35-14 fourth term. Cam Bairstow (20 points), Lamar Patterson (16) and Matt Hodgson (13) combined for 29 boards. Brisbane coach Andrej Lemanis said some modifications at the defensive end had helped turn things around dramatically. "We changed up what we were doing defensively," Lemanis said. "We started switching a bit more and trying to stay out of the rotations and make it more of a one-on-one, guard-your-man game. Import Demetrius Conger (25 points) and an often-frustrated captain Daniel Johnson (18) led the scoring for the 36ers, who the Bullets leapfrogged into fourth spot on the ladder after both sides entered the match on 10-9 records. Bairstow was productive early but when he sat out the latter stages of the opening term, the Sixers reserves pounced. Jacob Wiley flew for an acrobatic dunk and Deng slotted back-to-back triples, while at the other end, Adelaide forced the Bullets into a separate shot clock violations and closed the quarter with a 10-3 run to lead 24-21. Patterson was busy in the second stanza, as was ex-Sixer Hodgson who threw down a couple of dunks but it was still Adelaide 49-45 at half-time. Harry Froling drilled three triples in the third period and Conger contributed 10 points as the 36ers moved ahead by 11 before Patterson scored in the dying seconds to make it 76-67 at the final change. Adelaide went absolutely ice cold in the fourth, missing their first six shots, going 4 of 21 from the floor overall, including 0 for 7 three-pointers, and never recovered. It allowed the Bullets to steal the momentum and the lead which they never looked like relinquishing. Adelaide coach Joey Wright felt things turn when the Bullets fired off a bunch of points early in the fourth. "It was a five-point play off the free throw line that hurt us," he said. "(Brisbane) then (hit) back-to-back threes to score 11 points in less than a couple of minutes. "That changed the look of the game."